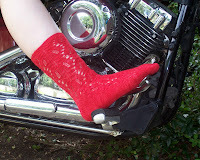 These lovely socks are knitted from the toe up and feature a deceptively easy lace pattern and short-row heels. 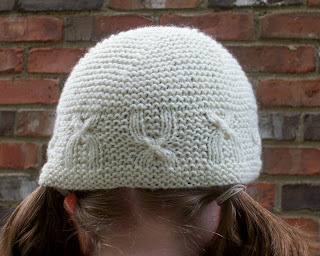 Here's another geeky knit from yours truly - cables that look like chromosomes! Display your dorkdom with pride. 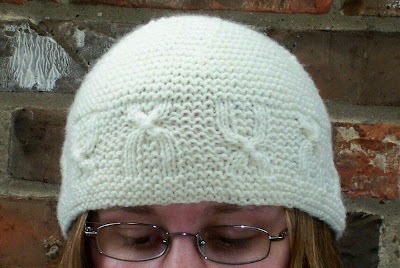 Note: When working in the round, alternate knit rounds and purl rounds to create garter stitch. CO 80 (90, 100) sts on circular needle. Join to work in the rnd, being careful not to twist. Rounds 1, 3, 5, 7: purl. Round 2 and all even rnds: knit. Round 9, 11: *[p2, k2] twice, p0 (1, 2)*; rep between *s around. Round 13: *p2, FC3, BC3, p2 (3, 4), k2, p2, k2, p0 (1, 2)*; rep between *s around. Round 15: *p3, wrap4, p3 (4, 5), k2, p2, k2, p0 (1, 2)*; rep between *s around. Round 17: *p2, BC3, FC3, p2 (3, 4), k2, p2, k2, p0 (1, 2)*; rep between *s around. Round 19: *[p2, k2] twice, p2 (3, 4), FC3, BC3, p0 (1, 2)*; rep between *s around. Round 21: *[p2, k2] twice, p3 (4, 5), wrap4, p1 (2, 3)*; rep between *s around. Round 23: *[p2, k2] twice, p2 (3, 4), BC3, FC3, p0 (1, 2)*; rep between *s around. Round 25: *[p2, k2] twice, p0 (1, 2)*; rep between *s around. Cont in garter st for 6 (12, 14) rnds, ending with a purl rnd. Dec Round: *k38, k2tog*; rep between *s around - 78 sts. Purl 1 rnd even. Dec Round: *k23, k2tog*; rep between *s around - 96 sts. Purl 1 rnd even. Switch to dpns when necessary. Cont to purl every other rnd even. Round 1: *k11 (13, 14), k2tog*; rep between *s around - 72 (84, 90) sts. Round 3: *k10 (12, 13), k2tog*; rep between *s around - 66 (78, 84) sts. Round 5: *k9 (11, 12), k2tog*; rep between *s around - 60 (72, 78) sts. 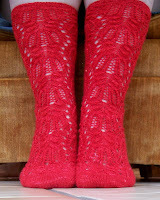 Cont to dec 6 sts every knit rnd in this manner until 36 sts remain. Purl 1 rnd even. Next round, k2tog around - 18 sts. Purl 1 rnd even. Next round, k2tog around - 9 sts. Cut yarn, leaving a 6-inch tail. Using tapestry needle, thread tail through rem sts, pull tight, and tie off. Weave in ends. This continues my tradition of knitting matching hats for all the children in my family (current count: 4) each winter. First, there were pointy Christmas tree hats with i-cord garland and button ornaments. The next year, it was snowman caps, plain white with carrot-shaped noses and button eyes and mini toboggan hats on top. This year, I decided to go a little less wacky since the kids are getting a little older now. Note: Your gauge in stranded stst and solid-color stst will be different. 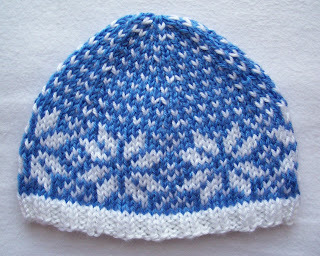 It is important to do a gauge swatch using the fair isle pattern. With White and circular needle (dpns for Infant size), CO 84 (96, 108, 120) sts. Join, being careful not to twist. Work in k2, p2 ribbing for 4 (5, 5, 6) rnds. Join Blue, and begin working corresponding chart. Switch to dpns when necessary. When only 12 sts remain, cut yarn and thread tail through remaining loops using tapestry needle. Pull tight and tie off. Weave in ends.